We can all rest a little easier tonight, at least until Saturday when they head back to Fenway, ’cause the Red Sox beat the Indians tonight to stay alive in the ALCS . 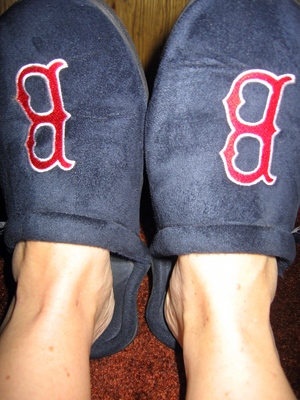 I was dressed from head to foot in Red Sox gear… even down to my toes in the Red Sox slippers on my feet. As Kaitlyn said – when we were enjoying our post-game celebratory phone call breaking down Francona’s decisions – it must have been the slippers. Damn straight it was the slippers! Keep them around- Just four more wins! Yippee!